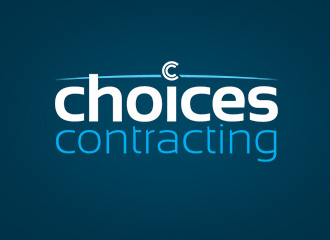 Choices Contracting offers self-employed operatives the opportunity to maximise their financial return, making it the obvious choice to ensure ongoing financial security. "It was a great experience working with Andrew and Rohan. 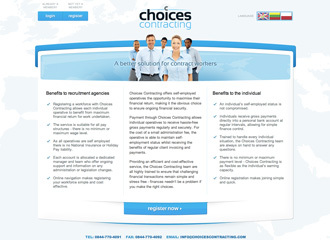 From the very first discussions they were completely focussed on the business requirements of our new websites. The questions that they asked left me in no doubt that the project would be a success, and the new ideas regarding branding and functionality that The Hatchery brought to the table have meant that we have been able to exceed our expectations." Create a striking brand and associated multi-lingual brochure-ware site that can be easily maintained by company staff, and which drives visitors to a registration process integrated with the company's internal systems. A beautiful, simple, and striking brand and website design with easy navigation and a focus on the call to action - client registration. The site is built on our Cloudbase™ content management system with multi-lingual capabilities activated.